Content Marketing Research: How Does Your Firm Rate? How does your firm’s content marketing strategy rate compared to the pack? IMN‘s 2013 Content Marketing Survey Report provides new benchmarks to help you evaluate your organization’s content efforts. About half of respondents have a formal content marketing strategy in place according to IMN’s research. Specifically, 31% of respondents have had a content marketing strategy for over a year and 18% of respondents have put a strategy into place within the past year. Further, just over one out of five respondents has a targeted plan for each channel. As content marketing evolves as a key marketing strategy, its goals are moving away from generating awareness and engagement to become better aligned with business objectives, specifically generating leads. 44% of respondents cited lead generation as their primary content marketing objective, almost triple last year’s 16%. Actionable Content Marketing Tip: Ensure that your content marketing strategy is aligned with your business objectives. The most effective content marketing vehicles as rated by respondents were social media (51%), website (44%), and emailings (42%) while blogs lagged (31%). Directionally, these results are similar to the findings of the Content Marketing Institute and Marketing Profs. While two-thirds or 67% of those surveyed use an email newsletter, about half mail it monthly and about a quarter mail it quarterly. This frequency is less than optimal for staying top of mind. Actionable Content Marketing Tip: Choose the content marketing formats that your target audience seeks and place them on the platforms where they spend their time. 15% had issues with borrowing copyrighted content without permissions. 13% had issues using photos to accompany content without permission. 13% had issues using a trademarked name and/or word. 7% incorrectly referenced industry research. Further, almost a third of respondents, who didn’t have problems with content curation to-date, worried about potential issues. Actionable Content Marketing Tip: Take time to understand how to curate content effectively. Where appropriate, get input from your Legal department. Creating quality content that generates leads and establishes brands and companies as thought leaders is a challenge for 44% of respondents with content marketing strategies in place. Their challenge is finding and sourcing relevant quality content. Only 27% of respondents felt that their organization’s content positioned them as a thought leader. Further 13% thought that their content read like MarCom and another 38% thought their content could be improved. Actionable Content Marketing Tip: Create content that speaks in a human voice and provides useful information prospects’ need. Bear in mind that this requires time, personnel and budget. While content marketing is a high priority for most respondents, it represents less than 10% of the marketing budget for almost half of them. Most organizations create at least some of their content internally. 46% of respondents use a mix of internal and external resources, 44% of respondents develop content in-house, and 11% of respondents outsource content development. Further 35% of respondents consider internal resource limitations to be a major challenge to implementing their content marketing strategy. The survey also found that 67% of marketers don’t use a formal editorial calendar; instead they create it on the fly. Actionable Content Marketing Tip: Plan your content creation in advance to ensure that you have enough content and related resources. Marketers are coordinating their content marketing objectives with their metrics as shown by the fact that about half of respondents track their success by the number of incoming leads and a fifth measure increased revenues. Content marketing is no longer just a buzzword. Your competition is using it and your customers are consuming it. Therefore you need to develop the best information you can with the resources available. What other content marketing tips would you add to this list and why? Tags Actionable Content Marketing Tip, Chart, Content marketing strategy, Research. Bookmark the permalink. 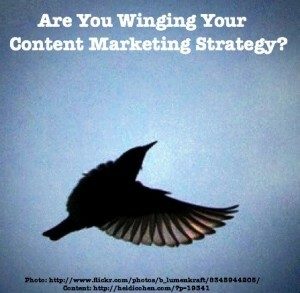 One Response to Are You Winging Content Marketing Strategy? Well hello Heidi, I am currently taking a pause from content curation as I want to take it further than just sharing other peoples content, although using an RSS reader like Feedly is a great way to highlight the thought leaders you wish to be associated with. As for an editorial plan that is something I have always struggled to get in place but then transforming our content from reactionary to leading is an important move that needs to be taken, will have to take another look at this.